Preserve the fall harvest of crisp, tart apples with our recipe for homemade apple butter. 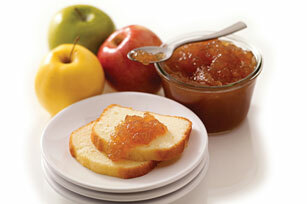 Spiced just right with allspice and cinnamon, this apple butter is made just like other jams, jellies and preserves. REMOVE blossom and stem ends from about 2 1/4 lbs fully ripe tart apples and cut in quarters. Do not peel or core. ADD 1 1/2 cups water and juice of 1 medium-sized lemon; bring to a boil and simmer, covered, 10 minutes. Put through coarse sieve. MEASURE 5 cups fruit pulp into a very large saucepan. ADD sugar and spices to pulp in saucepan and mix well. PLACE over high heat, bring to a full rolling boil and boil hard 1 minute, stirring constantly. Remove from heat. IMMEDIATELY stir in pectin. Skim off foam with metal spoon. POUR quickly into warm, sterilized jars filling up to 1/4 inch from rim. SEAL while hot with sterilized 2-piece lids with new centres.